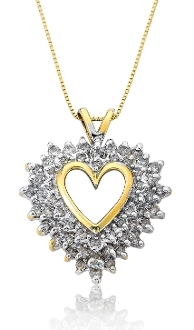 This romantic and trendy Diamond Cluster Heart Pendant is attractively designed in 14 Karat yellow gold and studded with two rows of sparkling Diamonds, totaling 0.90 carats. This gorgeous piece comes complete with a 16-inch box chain that is secured with a lobster claw clasp. The heart is a symbol of love and happiness, this sweet Diamond Heart Cluster Pendant is the best jewelry for all occasions and attire. Nothing can be lovelier than this beautiful fine Diamond jewelry.